Are games a suitable medium for teaching eight to fourteen year-olds about slavery? This teacher says unequivocally yes! Is “Playing History – Slave Trade” a suitable game for this purpose? During the last couple of weeks, the Danish edgame developer Serious Games Interactive have suffered significant blows to their reputation. Since launcing the game “Playing History – Slave Trade” on the game distribution service Steam, the company have faced a social media backlash for percieved racism and insensitivity. The criticism is primarily focused on a 30 second sequence where the player in a “Tetrisesque” mini-game, is tasked with loading as many tetrimino-shaped slaves into the cargo hold of a ship. Up until the controversy erupted, this was not a game on my radar. I have previously tested other titles from Serious Games Interactive such as the Global Conflicts series and President for A Day: flooding. Though when selecting games for classroom use, I prefer non-educational titles, both of these rank fairly highly on my list of learning games that work. These titles do have their weaknesses – Global Conflicts is a few years past its prime, and President for a Day employs a time constraint mechanic that also constrains students’ posibilities to reflect upon the content of the game. Regardless of this, I have no qualms in recommending these titles to budding teacher gamers who want to dip their toes into tteaching with games. 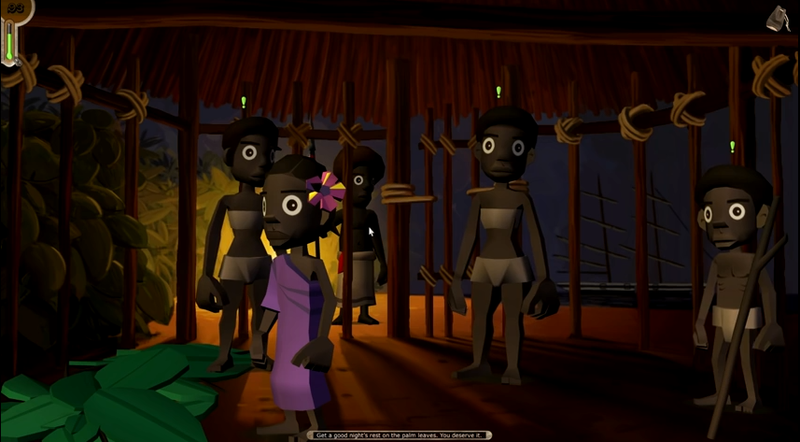 In «Playing History – Slave Trade», the player takes on the role of a young boy who serves as a steward slave to the British captain of a slave vessel. We follow this boy on a journey from England to Africa , where he is tasked to assist his owners negotiate the purchase of “fresh slaves” that will be taken to the slave markets in Barbados. I went into «Playing History – Slave Trade» with optimism. The short youtube clip which seemed to be the basis of the controversy did not discourage me. To the contrary, I believe that Tetris can serve as an effective and poignant analogy to emphasize slave traders views of African slaves as dehumanized commodities. The youngest cohort of the target audience for this game can be expected to have very little pre-knowledge about this despicable era of Europoean history. A well-known visual image like Tetris can be an excellent starting point for meaningful reflection and discussion. This must however be approached with sensitivity, not neccessarily within the game, but certainly in the classroom learning experience where such a game is used. In several aspects of this game, the developers have made sound design choices. The game mechanics are intuitive, and the graphics are not unappealing. The quality of voice acting was also surprisingly good. Both visually and mechanically, the game has commonalities with adventure games of the late nineties like Monkey Island 4 and Grim Fandango. Within the learning game genre, «Making History – Slave Trade» appears to be a game that has been put a significant amount of time, money and effort into. Being a teacher in Scandinavia with an above average interest in games and learning, I am excited that non-gov developers in Scandinavia are willing to make investments in edgames. However, it is with sadness that I have to state that this is a game that I under no circumstances can reccomend, neither in or outside of school. According to Serious Games Interactive, this game has been used by between 5-10 percent of Danish schools. I have a very hard time believeing this, as I have yet to hear from a single Danish teacher who has used this game in class. But for the sake of argument, let us say that they are correct. In a classroom where students can discuss their experiences in-game with a well-reflected teacher, there might be some merits to using this game. However, by releasing this game to the consumer market, in effect encouraging students to play this game without mediation is inforgivable. Without significant mediation, this is a game that can leave young players with a significantly warped idea of an era that is a stain on European History. Though the controversy surrounding this game grew out of the inhumanity of portraying people as mangled tetris bricks, the problem is not that the game is too gruesome. It is not gruesome enough. The game has a light-hearted, playful and naive tone which is completely inappropriate for the serious topic it is meant to cover. At first, I thought this was intentional – start out with a playful tone, to later smack the player in the gut as she is confronted with the harsh reality. However, this blow to the gut never occurs. The lightheartedness of the first 10 minutes remains throughout the entire two hour duration of the game. As a 30-year old teacher playing this game, I’m fairly concious of slavery being an absolutely disgusting institution. However an 8-10 yearold with limited preknowledge, might leave this game with an understanding that slavery was mildly unpleasant, but viewed as perfectly acceptable by the slaves themselves. This understanding is affirmed and reaffirmed throughout the entire progression of the game. To be fair, the player is told by a narrator that slavery is indeed horrible, but the experiences in the game convey a message that it wasn’t really all that bad. When the player arrives in Africa, he is tasked with negotiating a trade with the local tribal leader. The goal is to purchase as many slaves as he can for as few units of weapons and booze possible. As it turns out, one of these slaves is his long-lost sister. In the dialogue between the two, the developers have an excellent opportunity to supply a powerful narrative of the horrors of slavery. This opportunity is squandered. Rather, the characters entire interaction revolves around a flower they believe will greatly improve the morale of the captured slaves. Not one word relating to the actual conditions of captured slaves, nor how these might be improved. This scene concludes with the sister acquiring this elusive flower, upon which the narrator informs us that she has done a great job, and there is nothing in the way of a good night’s sleep. How well can we expect this girl slept within her cramped cage awaiting transport to a slave vessel in the morning? Get a good night’s rest on the palm leaves. You deserve it! Critics pointing to racist overtones in this game have primarily pointed the finger towards the tetris segment. As I’ve made clear earlier on I believe this to be an excellent point of entry for discussions about slavery specifically or human rights and dignity in general. I’m also left with the impression that while the European characters generally come across as civilized, the Africans appear to be to simple-minded to understand their own good. This is particularly evident in a scene where Piri, the sister of the main playable character interacts with the slaves below deck. On the picture below we have just been informed that the ship is several weeks enroute to Barbados, and morale among the slaves is low. Regardless of this, the slaves seem completely oblivious of the seriousness of their situation. Piri has similar interactions with three other slaves who all come across as equally dim-witted. The prime example is the slave Tembo, who when asked if he is planning an escape replies: “Plans? No plan! I’m pure action, pure doing. I’m pure dynamite, pure plan!”. Immediately after this, Tembo breaks his jaw in a futile attempt to bite through his metal chains. The developers completely squander an excellent opportunity for conveying the plight of the captured slave, by rather including completely misplaced instances of comic relief. This design choice is prevalent throughout “Playing History – Slave Trade”. The game’s framework has the potential to create meaningful learning experiences, but this potential goes unfulfilled. Should there be any doubts about my view of this game: I find it difficult to think of any learning situation where this game would be anywhere close to being the most suitable resource. I have even stronger objections to this game being played outside of a formal learning situation. The game does have elements which, if the total package had been significantly better, do have definite value. However, somewhere in the design process, several people have clearly made a series of poor choices. I like Serious Games Interactive. In Scandinavia, I can’t think of an edgame company better resourced or more dedicated. However, if they continue marketing this game to both educational institutions and to the consumer market, I fear this will tear the reputation of a company that has done important work for games and learning in Scandinavia will be torn completely to shreds. I have yet to get in contact with a single educator who has experience using this game in a classroom. Are you such an educator? I’d be thrilled to discuss the game with you. ‹ PreviousLære om slaveri ved hjelp av dataspill? Gjerne det! Some kids are visual learners; these are the kids who benefit the most from online educational games for kids. Seeing the concepts right in front of them allows these visual thinkers to work out the problem right in front of them, rather than trying to understand something they cannot see.